It’s Sunday and I think this recipe is worth the wait. I’ve used this recipe at many of my events and it was a huge success, so here is the secret. Enjoy, and happy first Advent! Blend all ingredients for the beetroot cure and engulf the salmon with it. Place the fish over night or 24 hours in the fridge so that all the flavour can seep into the salmon. The next day take the salmon out of the fridge and gently rub off the beetroot cure. Place the fish on clean wrapping paper and proceed to blend all the ingredients for the herb cure and spread it all over your salmon. Place fish back in the fridge over night or 24 hours. Next day gently remove the herb cure and start to slice the fish into 1 mm slices, trying to avoid the bottom skin of the fish. Strong tip/suggestion: use a very sharp knife – it will make your life a lot easier. 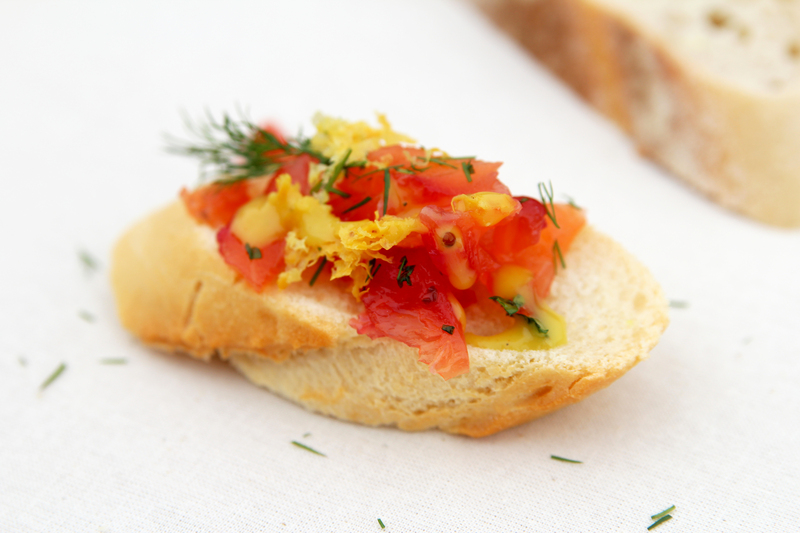 You can then place the sliced gravlax on a baguette slice and serve it with honey mustard and fresh dill. This is a great recipe to use when you are entertaining guests or to bring to pot luck parties. You will look like a star! The fish lasts up to a week (make sure it’s properly refrigerated). This holiday you can impress yourself by trying this recipe and sharing your results with people.